Our people are highly experienced training and development professionals with passion and enthusiasm for people development. We offer “value for money” service with quality program design and delivery to meet your needs. We are trilingual in English, Cantonese and Putonghua that can serve your staff in Hong Kong, Mainland China or other foreign countries. Most importantly, we deliver our service from the Heart !!! Ms. Maria Leung, our Founder and Principal Consultant, is a specialist in people development. 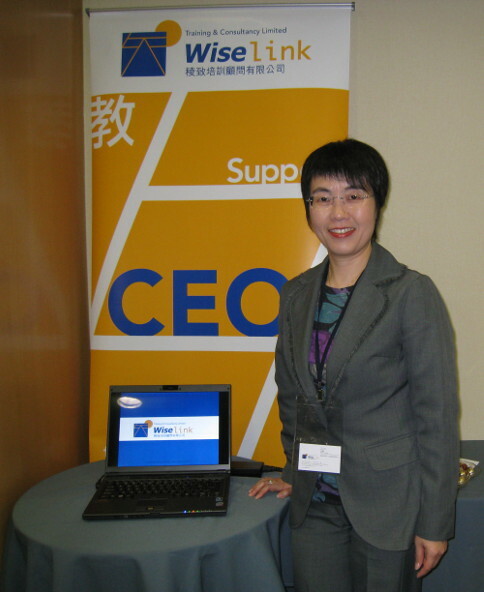 She acquired about 20 years’ experience in people and business development. The companies she has served for include the theme park, leading telecommunications company, multinational multi-disciplined commercial organization, various business corporations and government offices. She has also overseas working experience in China and US. She received her Master Degree in Knowledge Management (MScKM) at the Hong Kong Polytechnic University. She established enthusiasm in KM, especially in KM methods & tools, personal KM and organizational learning. In March 2013 she become a founding member and a nominated leader of KMP2P, a Community of Practice (COP) for developing MScKM Graduates to become KM practitioners or KM professionals. In 2005 she got her Master of Arts in Human Resources Development at George Washington University, US. She is a practitioner in Neuro-Linguistic Programming (NLP), has been an experienced Toastmaster, as well as members of HKIHRM and ASTD. She is also an Accredited Administrator of Myers-Briggs Type Indicator (MBTI). She believes that a better understanding of oneself, a mastery of knowledge and skills in management, communication and services will enhance our worklife quality and bring happiness in our life journey. Dr. Appleby is an organization development consultant with over 30 years of management, consulting, and coaching experience in government, industry, and non-profits. He provides clients with assistance in strategy development, organizational assessment, work system design and change management. In an increasingly competitive and turbulent world it is the skill with people which determines who moves ahead more so than technical ability. Dr. Alan Stewart, PhD, is a Facilitator and Communications Coach. He enables people in organizations, large and small, to engage in constructive conversations about things that matter. Written communication on-the-job is essential for success. Susan is an expert in helping you write well: clearly, forcefully and persuasively to achieve results. This can be done in small groups, one-on-one or online. For trainer/consultant profiles, please feel free to contact us.